Watson's first appearance on the short-lived 'reader profile' slot. - and let’s pause here to acknowledge the delightfully bizarre fact that Mr Watson (aka Button Man, aka Comic Book Guy, aka Jolyon Wagg, to pick out his internet handles / avatars) has had more of his work printed in the Prog or Meg than the likes of Simon Bisley or Bryan Talbot, to name just two all-time comics legends. He’s even been paid for it, in the form of postcards, Heroclix figures and no doubt a library’s worth of 2000AD collected editions. Zarjaz! Don’t worry, I’m not actually going to spend a blog post analysing the style and content of Stephen Watson’s writing. Frankly, he’s done that plenty enough all by himself. But I will say that Tharg’s Nerve Centre / Input page has ever been a vital part of the Prog reading experience. 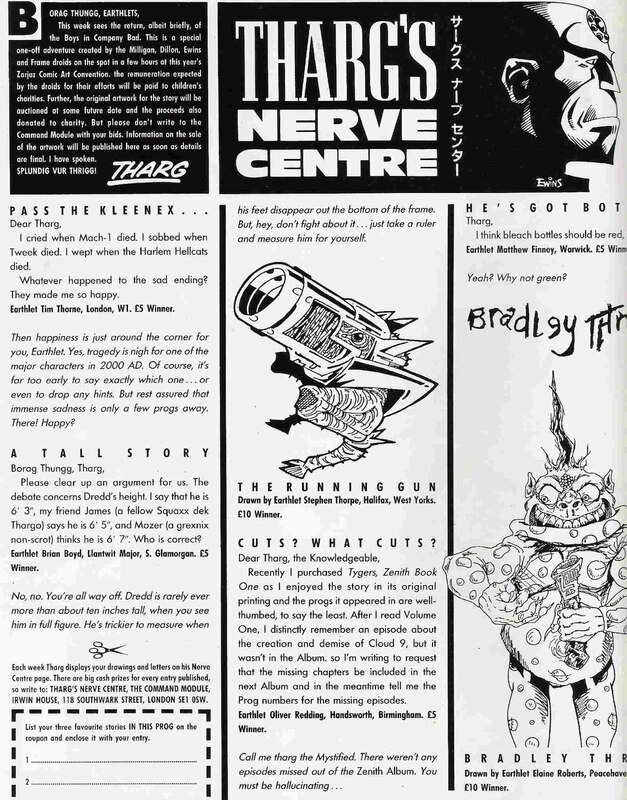 Classic era Nerve Centre, with editorial and letters all on one page. 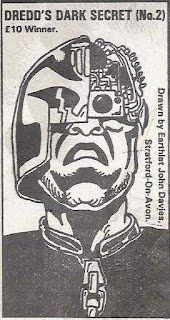 I'd guess Steve Cook is on layouts at this point, and Alan McKenzie is doing the Tharg thing with words (Burton on editing). I miss the three-handled scissors joke. 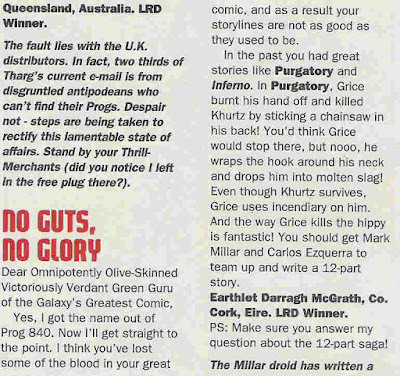 Sometimes, it’s the reader’s letters that raise a smile, more often it’s Tharg’s withering replies and effortless ability to never answer specific questions about when a favourite series is coming back, unless it’s in the very next issue. And of course there’s the sense of community it brings. Even people who would never dream of writing in (and I was such for at least 15 years of being a regular reader) can enjoy the fact of seeing other fans giving an opinion. 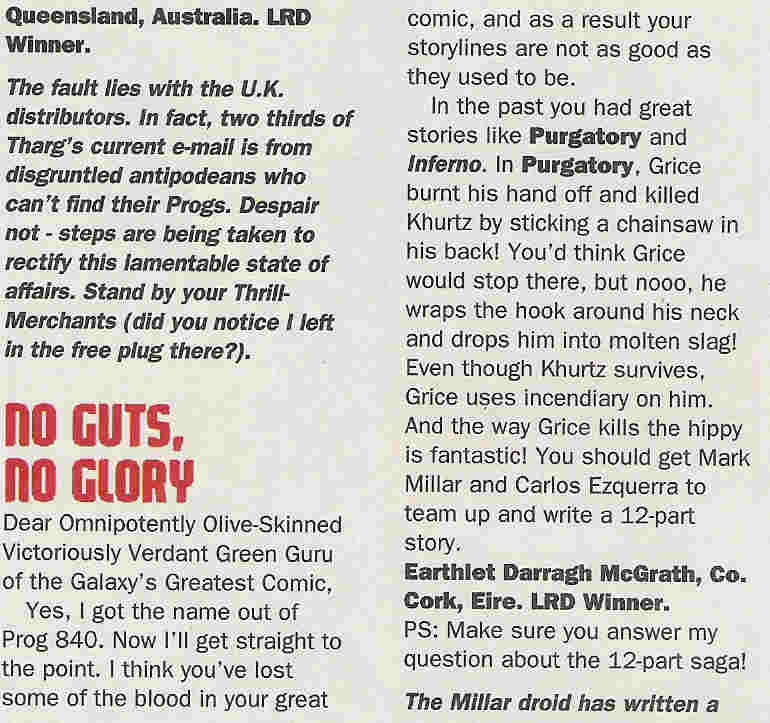 Before the internet, or more specifically, before the 2000AD forum opened up, these letters were the only way I had any sense of what any other 2000AD fan liked or hated about the comic. And boy, do people have some contrary opinions sometimes. McGrath has a point - you gotta watch to ensure any given Prog meets its gore quotient. as a stone-cold classic, which confused me. 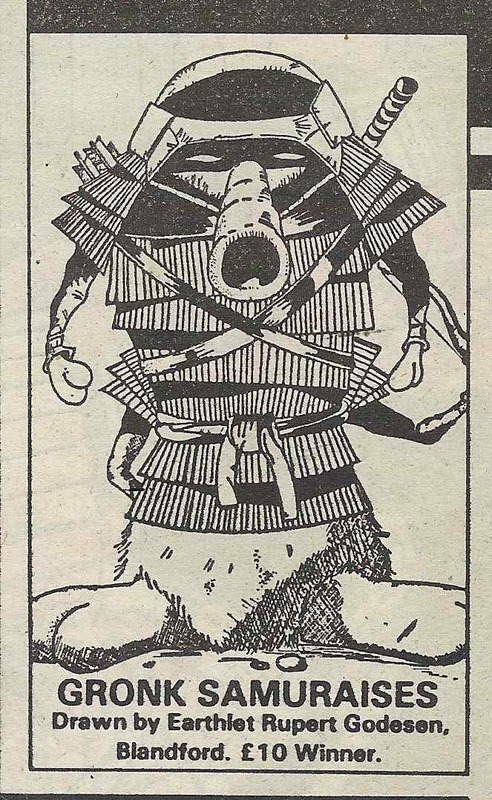 No less a person than Pat Mills has often stated how much readers letters and polling charts were taken very seriously by editorial. For whatever reason, letters from children are seemingly listened to more than internet postings from adult fans. I wonder if it’s just a matter of numbers? 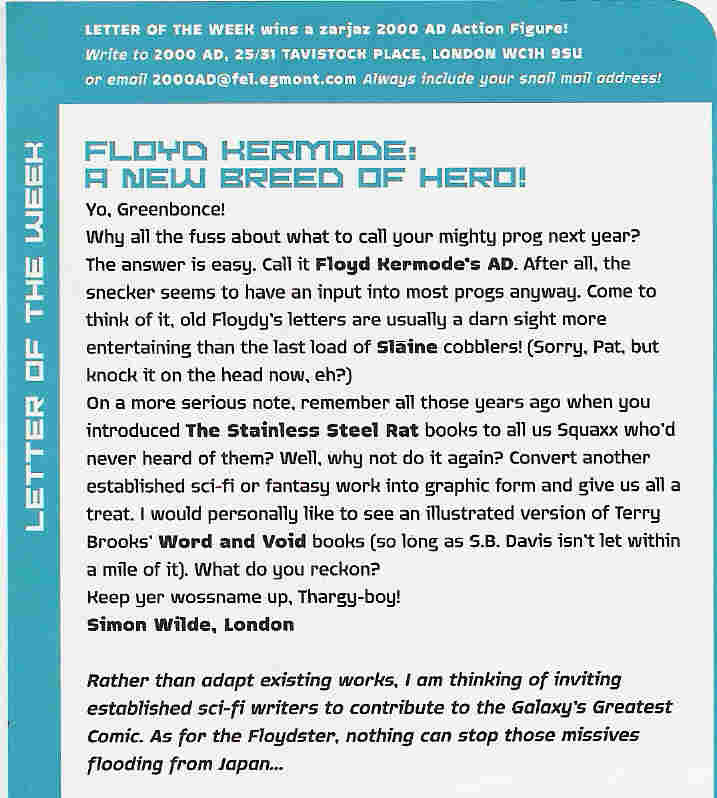 There are surely more people who’ve had letters published in 2000AD than have posted something on the forum, for example. And that’s not counting the many who wrote in but weren’t printed. I’m not entirely sure it’s fair to say that someone who writes a letter to a comic is inherently more ‘mainstream’ than someone who posts on an internet forum, but what do I know? 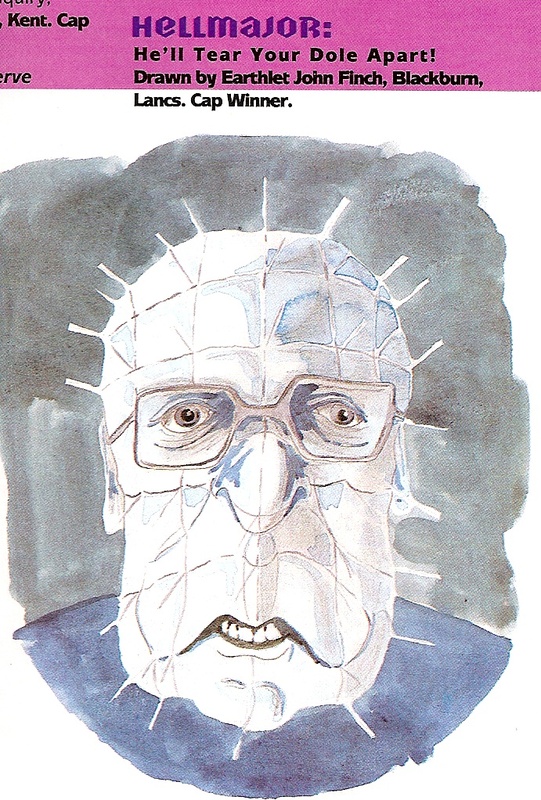 I’d like to think of myself as someone who approaches 2000AD with a mainstream sensibility, but I’m also aware that I’m an obsessive who has surrounded himself with comics his whole life, 2000AD especially. Back to the celebration of letters pages! For a long time, it was pretty unusual to see a reader’s letter – or drawing – from a name you recognised. But then in the 90s some names started to recur. 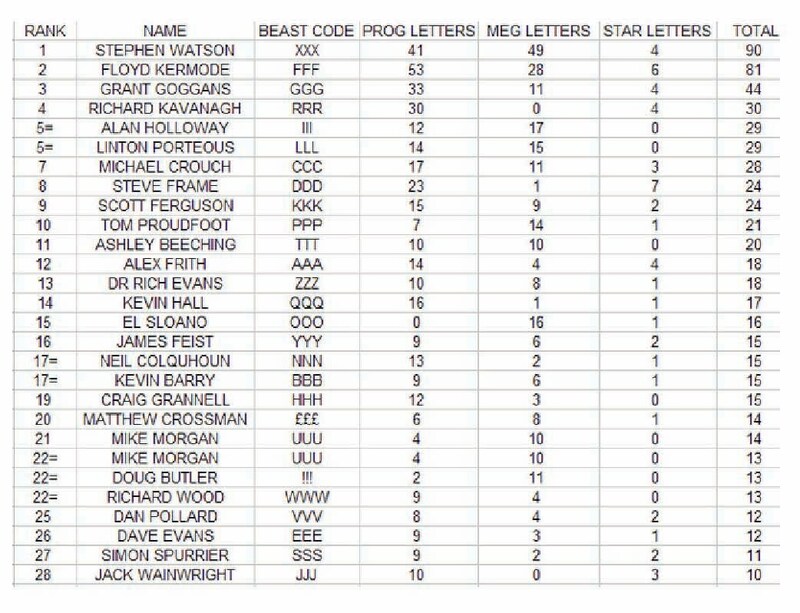 Two big names in letters on one Input page! Partly it’s because they had unusual names – Floyd Kermode and Linton Porteous, I’m looking at you – but partly it must have been because fewer and fewer people were writing in – even when email took over and made it all easier, I imagine the numbers were down on the heyday of 1986. Heck, by the mid 2000s, I was recognising even the more ‘anonymous’ names, (no offence, Steve Frame and Ashley Beeching). As a forum regular, the letters columns can sometimes be an extension of my forays into internet fandom. 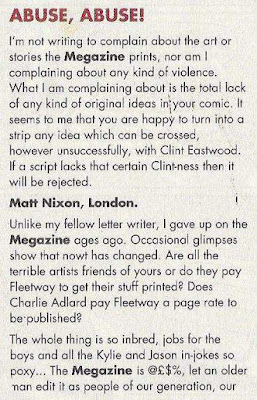 A letter from Grant Goggans, for example, carries a certain weight, because his love for 2000AD is well documented. 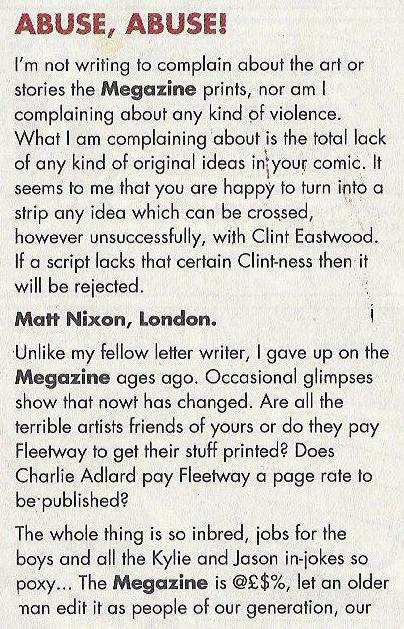 Or one from Dave Evans commenting on the quality of strip and art has the ring of truth from a working editor. The first letter writing stars I noticed were in fact in the pages of the Megazine. 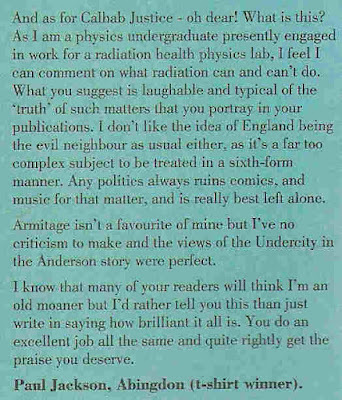 Then-editor David Bishop clearly enjoyed the reader interaction bit, and encouraged debate. Bishop liked to run letters that gave strips a kicking. Two names, of people who may or may not have actually been chums, came up a bunch of times, often as a double-act, and often under attack for their forthright views: it's Matt Nixon & El Sloano. I’ve already name-checked Floyd Kermode*, but one can’t underestimate his presence in the Prog. It got to the point where other letter-writers referred to him in their own letters. And it didn’t hurt that he wrote well. 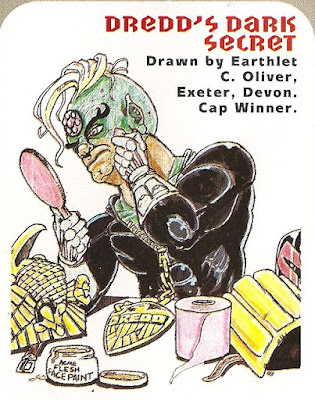 He certainly earned his spot as a 2000AD fandom-celeb in his own right, with a delightful monthly column once upon a time. Yup, that’s me at number 12. I’m not proud. 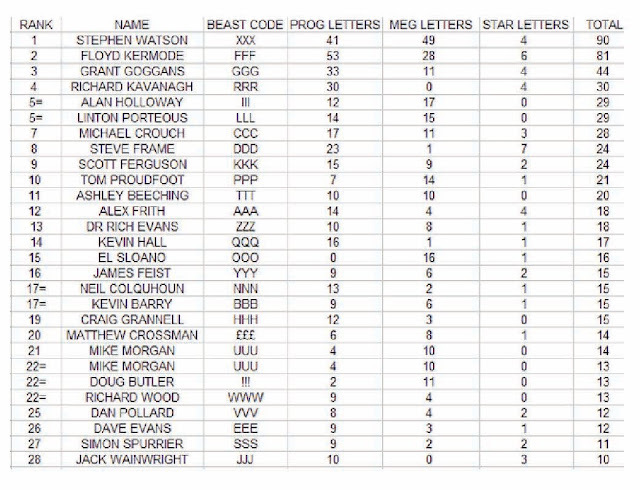 And yes, that’s THE Simon Spurrier at Number 27, the most prolific letter hack turned script droid. Other big names on that front include Warren Ellis. But let’s move onto the Reader Art. 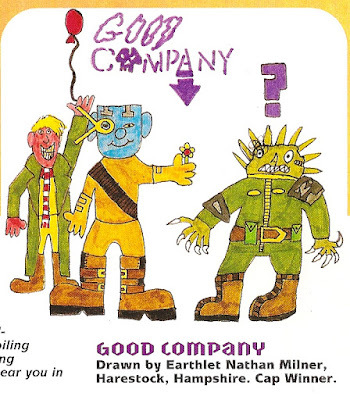 Much harder to get a picture published lately, especially since Tharg unofficially stopped printing anything other than photos of tots with Progs, Tooth Tattoos, and a slew of amazingly impressive fan-built models, replicas and other such creative delights. The mash-up often extended to real-world figures. It probably wouldn’t sell too well (Wardog / Bison levels, not Case Files levels), but a collection of 2000AD reader art would be tremendous. Flog it to Hipsters in Hoxton and you’d get several pounds at least. 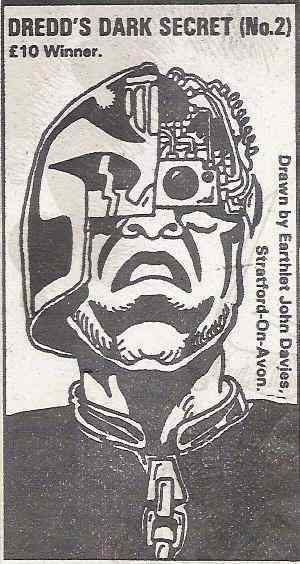 I couldn’t resist compiling a few examples here, especially the long-running Dredd’s Dark Secret series that was in full swing when I first laid eyes on the Prog in 1985/6/7. All credits are on the scans. And yes, Dark Secret #3 is missing! Couldn't find it for the life of me, but it's lurking somehwer in the mid-400s, or maybe a Special? Simon Spencer? Could it be..? The list of future art droids who had reader art published is an ongoing project. Much of it listed here. What I'm saying is, hold onto your old Progs! Until it's all digitzed, there's no other way to preserve these lovely slices of fandom. How important is a letters page? -more of the same, but only 2 pages-worth this time. – a 2016 variation compiling examples of future writers/artists to have appeared in the Prog. *Fans from the late 90s may recall that Kermode lived in Saitama, Japan at the time. Not because of him, but I ended up there myself for six months in 1997. I can see why he wrote a lot of letters (not because it’s boring, but travel/going out was hella expensive). Thanks for this Alex - name up in lights at last! You should be proud - 12 letters is a decent score! Future generations may marvel at the miracle that is The Beast: online!